Subway introduces new Sunflower Crunch Bread for a limited time and is featuring it on the new Chipotle Cheesesteak. The new bread takes the chain's bread dough and adds a Sunflower Crunch topping before baking. The "new" Chipotle Cheesesteak is only really new due to the new bread as they've offered the Chipotle Cheesesteak before (as the Chipotle Steak & Cheese). 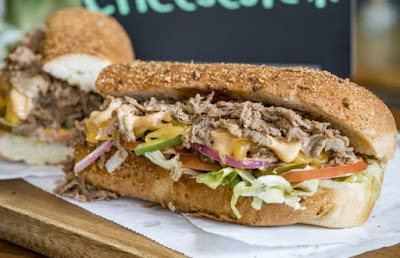 The sandwich features steak, shredded Monterey Jack and cheddar cheese, lettuce, tomatoes, green peppers, red onion, jalapenos, and Chipotle Southwest sauce on Sunflower Crunch bread. Besides the bread, you can custom-order a Chipotle Cheesesteak well after the promotion is over.